Irish shamrock ornament features laser cut wood construction that is enhanced with Celtic knot-work. 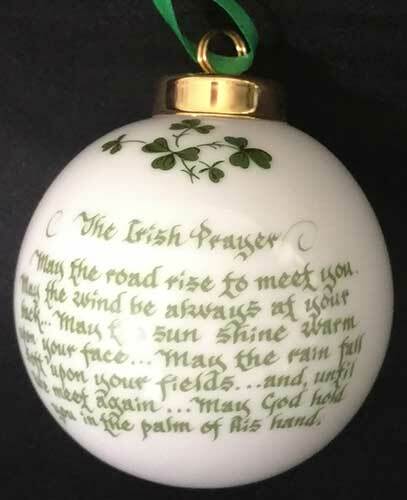 Irish ornament features a lass along with the words to the Irish blessing. Irish ornament features the word brother along with a cottage and the Irish blessing. 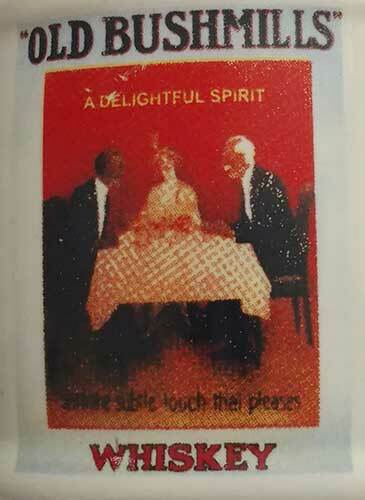 Irish ornament features the words faithful employee along with a cottage and the Irish blessing. Irish coffee Christmas ornament features a mug along with a shamrock and banner. This motorized hanger will gently rotate your Irish ornaments on your Christmas tree. This porcelain Irish Christmas ornament features a horseshoe that is enhanced with shamrocks. Irish ornament features Santa with a shamrock and Christmas tree. Sorry this Irish Santa ornament is now sold out. Celtic cross Christmas ornament features the Irish blessing and is enhanced with knot-work along with a shamrock. 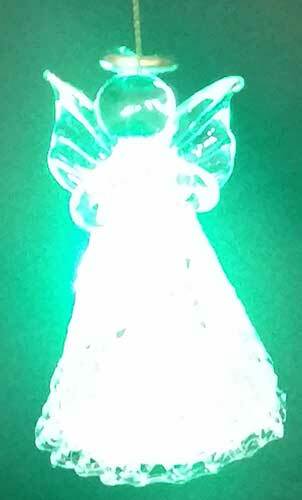 Irish Christmas ornament features an angel with shamrocks along with a blessing banner. 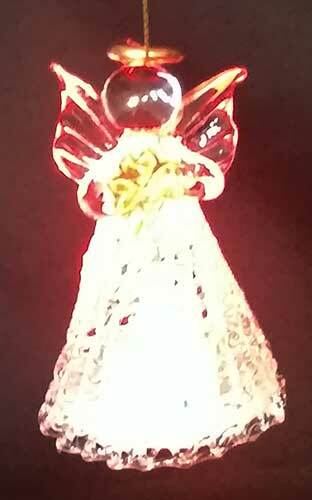 Irish Christmas ornament is an illuminated glass angel holding a shamrock. 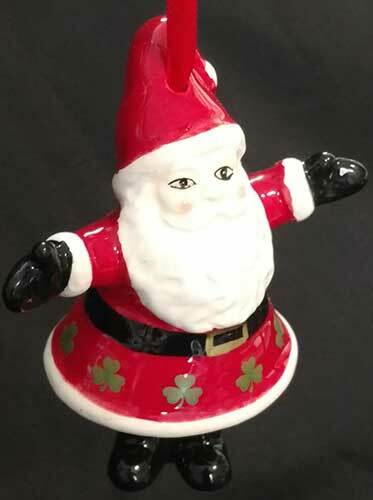 Irish Santa Christmas ornament is a bell that is accented with shamrocks. Celtic cross ornament features an Irish home blessing along with shamrocks. We hope that you enjoyed browsing through our selection Irish Christmas ornaments, but did you know that we have additional ornament selections from Belleek and Royal Tara? 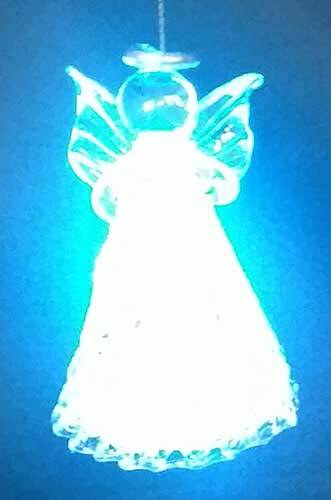 The Irish Gift House also features an assortment of Irish angel tree toppers that may also be used as centerpieces; many of these angels feature shamrocks and Celtic knots and several illuminate. Please also take a look at our collection of Irish Santa figurines that include the very popular fireman and policeman; these versions of old St. Nick are very festive and will make a great gift that can be displayed throughout the year. Just to let you know that we moved our assortment of Celtic snowflake jewelry out of the Irish Christmas Decorations category and put them in the Celtic Jewelry category. Here you will find Celtic Christmas jewelry with Trinity knot snowflakes and shamrock Christmas trees and you may select from necklaces, earrings and brooches.